About ten years ago, some photographer friends and I set out to shoot the Twin Towers from Liberty Park in Jersey City. It's the best spot to get this particular view of the buildings and they felt so close you could reach out and touch them. 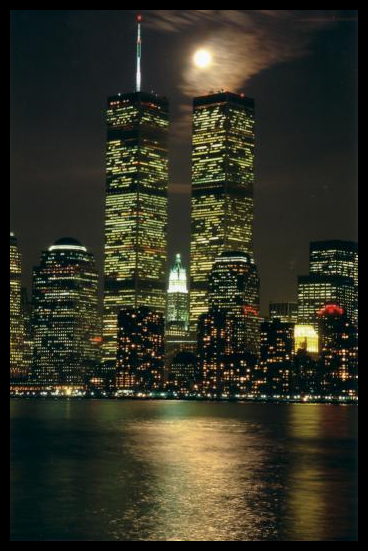 It was in December during the full moon, as this is the only time the moon passes right between the Twin Towers on its nightly path across the sky. We arrived early took shots of the boats in the Hudson and waited eagerly for the moon to rise - and we waited and waited for almost two hours. We decided we must have the wrong night and packed up and left. As we started to drive out of the park and we realized we were headed in the wrong direction. As we turned the car around, facing the river again, we saw this huge, bright, gold moon just above the horizon - finally making its appearance. Happy that the wrong turn provided us with the chance to capture the scene, we shot endless rolls of film following the assent of this celestial beauty.It was an experience I will never forget - everything was just perfect, clear, still night with just a few puffs of clouds every so often that added some drama to the picture as well as providing lovely reflections on the Hudson. We never imaged this would be the last time we would shoot these majestic buildings. And now every time I look at an image of them, particularly when it's a picture taken before 9/11, I get a lump in my throat.